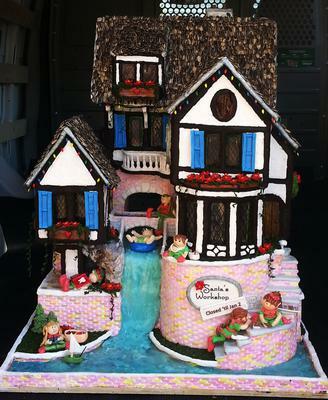 I entered this house in the 2014 Belleville Gingerbread Walk. It received Best in Show. The house contains 12 lbs of pez, 7 lbs of gum paste, and countless pounds of royal icing. The windows were made from gelatin using veining sheets. The grass is parsley. I had my local grocery store print out my signs on rice paper with edible ink. I transfered the rice paper to gum paste to make them stiff. The theme of my project is what elfs do during their Christmas break once all the work was done. One elf is sleeping with a Dentistry book; another is playing with a radio-controlled sail boat. An elf is riding an intertube ready to go down the waterfall and two others are attempting to make a gingerbread house. Santa is sleeping in a back room in a recliner. Your gingerbread creation is very impressive! Clean look and not too busy! Great job! I like your boat!